What a great end to a fun hop. "Sew" many fun new fabrics, and "sew" much inspiration. but lets not share that little detail with my hubby! 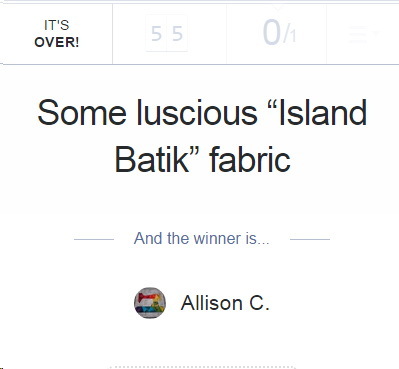 The winner of my package of Island Batik is Allison. and I will get it on it's way to you. and leaving such sweet comments! and we have new things to share. This month it's Bountiful Table Toppers. You know how we all love to dress up our tables. Nothing can change up the mood quicker than a new topper.